Broccoli Basil Frittata covered in mozzarella cheese, baked in a cast iron pan. Easy brunch, lunch or dinner. 1 large bunch of broccoli or enough to cover skillet, cut into small pieces. Saute broccoli in olive oil. Season with salt and pepper until cooked but still firm as it will continue to cook in oven. Beat eggs. Add salt, pepper splash of fresh cream and just a touch of nutmeg. The cream results in a richer texture, but is not absolutely necessary. Once broccoli is sauteed, make sure the pan has enough oil on bottom and sides so that the eggs don’t stick, approximately 2 tablespoons. My pan is very well seasoned (cured) and I probably used 1 tablespoon. Add beaten eggs. Arrange mozzarella evenly, but not covered all over. Bake in a 375 degree oven for 25-40 minutes or until the middle is set. Check at 25 minutes. The time will depend on size of pan, your oven, etc. 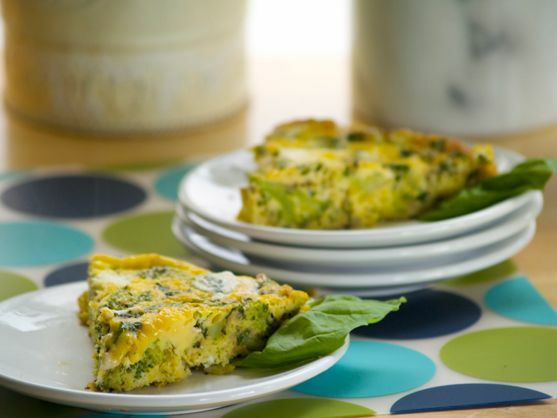 Once frittata is removed from oven, allow to cool for at least 10 minutes. Cut into wedges. Frittata is best served at room temperature.